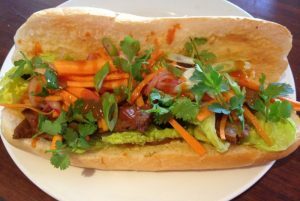 I’ll go out on a limb and say that Banh Mi are one of the most delicious things in the world. A happy marriage of french bread and vibrant vietnamese flavours. Crunchy, spicy, salty, sweet, pungent and fresh. I love them. I got the urge to make them when I saw some people eating them for lunch the other day. I haven’t eaten one since going vegan. There is no reason not to, they’re easy to replicate. So the next day I set about making some. Mine are made up of a crusty baguette, filled with some sort of protein, lettuce and cucumber, some vegan mayonnaise, spicy chilli, coriander, spring onion and a mild quick sweet pickle of carrot and onion. I used some seitan for my protein using a recipe from The Post Punk Kitchen. I don’t know what it is with me and seitan, but this recipe is the only one I’ve ever made that worked and tasted good. Put the vinegar, water, sugar and 'fish' sauce into a bowl or saucepan and microwave or heat until the sugar dissolves. Allow to cool a bit. Add the carrot and onion to the vinegar mix and allow to steep for 10 minutes. while you assemble the remainder. This will make enough pickle for 2 baguettes. Slice the baguettes in half and spread with the mayo. Add the lettuce, fried seitan/tofu/tempeh, cucumber, pickles, spring onions, sriracha sauce and fresh coriander leaves. Any type of vegan protein would work well here, so choose your favourite. I had some seitan so that is what I used. I sliced and fried to brown it off a bit. Tofu and tempeh would work well too. Some of the pre seasoned ones would be great. I got my vegan fish sauce from The Cruelty Free Shop.